After our 14 yr old lab etc. 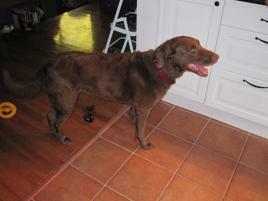 mix died, we were looking for a laid back companion for our remaining 9 year old lab/whatever mix, Abbey. 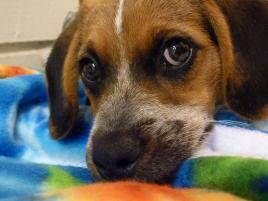 We saw Penny, a beagle collie mix on Petfinder. I made my boyfriend at the time come with me to the shelter to make sure I came home with ONLY 1 dog because I knew better than to trust myself. When we met Penny, we were somewhat disappointed. 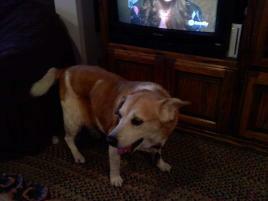 She seemed much older in person and had very bad arthritis and was overweight, causing mobility issues. Or current dog was still very active, so it was clear that Penny wouldn't be a good fit. A shelter employee introduced us to a wiggly little 10 year old beagle named Emma who hit it off with our dog right away. It was clear that the beagle was a better fit, but we couldn't stand to leave poor old Penny to die in the shelter - she deserved a comfortable home, even if only for a few years. As we loaded the two new dogs into our car, I looked my boyfriend in the eye and told him "You failed..." We have now been married for just over a year, and Penny, Emma and Abbey are all doing great. 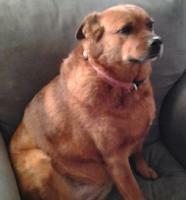 Penny has lost a lot of weight and can really get around better.